Wahama junior Trevor Hunt locks in a hold on an opponent during the Skyline Bowling Wrestling Invitational held on Dec. 29, 2018, at Gallia Academy High School in Centenary, Ohio. SAINT MARYS, W.Va. — The Wahama wrestling team came away with two individual championships, a quintet of top four efforts and tied Doddridge County for fourth overall on Saturday at the fifth annual Blue Devil Alumni Tournament held at St. Marys High School in Pleasants County. The White Falcons joined DCHS in the top half of the 10-team field with 82 points, which placed both programs in the four spot. Wirt County won the event with 131.5 points, with Ravenswood (121) and St. Marys (111) wrapping up the two and three positions. 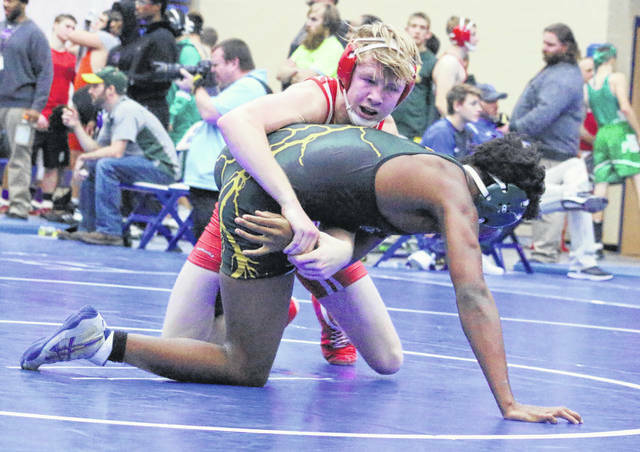 Wahama received weight class titles from Trevor Hunt at 145 pounds and Antonio Serevicz at 220 pounds, both of whom posted identical 5-0 records in their respective divisions. Serevicz scored four pinfall wins and Hunt had three pinfall victories. Emma Tomlinson and Aaron Beard both came away with third place efforts in their respective divisions. Beard went 4-1 with three pinfalls at 195 pounds, while Tomlinson was 3-2 overall with two pinfalls at 106 pounds. Wes Peters was fourth at 152 pounds with a 4-2 mark and two pinfall wins. Shawn Taylor was also seventh at 195 pounds with a 2-2 record. Wirt County led all teams with four weight class champions, with Wahama and Parkersburg South following with two apiece. St. Marys, Doddrdige County, Ravenswood, Parkersburg, Poca and Fort Frye also came away with an individual champion each. Visit wvmat.com for complete results of the 2019 Blue Devil Alumni Tournament hosted by St. Marys High School on Saturday.